If your motorbike has been sat in storage over the winter then you’ll need to prepare it before you crack it out and on to the road. To use the example of a sprinter, you wouldn’t attempt the 100m without warming up and some sort of training, and if you did, you’d expect an injury. Similarly, your bike has been sat still in the cold and the dark for maybe three or four months, so you need to get it ‘road ready’. We’ve created this checklist on getting your bike ready after a winter in storage. Check your tyre pressure on both wheels because tyres generally lose pressure slowly over time. Cold temperatures exaggerate this pressure loss, too, so it’s vital that you check tyre pressure before you do anything else using a pressure gauge. Compare the reading to the one stated in the owners’ manual and alter your tyre pressure accordingly. You should also check your tyres for any other damage associated with a lack of use and cold temperatures, like cracking. While you’re at it, you may as well check your tread depth, too. The legal limit for tread depth is 1mm across the middle three quarters of the tyre, we’d advise keeping tread depth at 2.5mm or more. You can check each component of your bike individually but by rolling your bike a few metres forward you will be able to see if anything has seized up or locked. If your drive chain is too tight you will become aware of it when you roll the bike and you can also check your steering, feeling if it is lubricated or if it has become stiff after months of sitting around. A roll of your bike should get some of the liquids and fuel moving about and should reveal any leaks. It’s always a good idea to lubricate your chain, levers and grips if they are sticking. It’s also a good idea to lubricate the stand as well – it’s been engaged for four months potentially, so it’s probably in need of a bit of TLC. When rolling your bike you should check your brakes to see if they feel and sound right. However your brake inspection should be more thorough as they’re obviously pretty important. Get on your hands and knees and check your brake pads. Brake pads need to be at least 1mm thick and if they’re approaching that legal limit, it’s a good idea to change them now. You should also check your brake lines for cracks or leaks and fill your brake-fluid to the proper level. You should check your motorbike’s fluid levels and top them up accordingly. This means coolant, brake fluid and oil but you should also check for changes in the colour of the different fluids. Over three or four months, your motorbike’s liquids and fluids shouldn’t degenerate too much but it’s worth checking them and replacing them with fresh liquid if they don’t look right. If you have not used a trickle charger over the winter months then your battery might be flat. You need to check it before starting your engine. 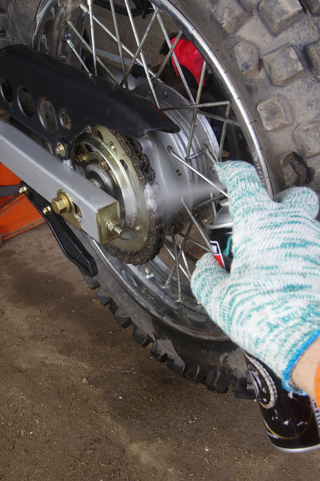 Check the terminals for dust, dirt or any rusting and make sure they are clean before connecting them. You should start your engine up and leave it running for a couple of minutes before revving it. While you’re waiting for it to warm up you can check that the controls and lights are working properly. This includes your headlight, brake lights and your horn, as well as your signals. You can also take this time to check any cables or fluid lines for cracks. Once your engine has warmed up, rev it but don’t get on it and ride away just yet. After you’ve revved it up, turn it off and then return it to the side stand and check for any leaks or anything unusual. Back to the athlete analogy, but before a big race athletes train and practice to get sharp. And the same applies to going back out on your motorbike. You will be rusty and it will take time for you to get back to your pre-winter riding levels. Take your time to get up to top speed. Most motorbike insurance policies will renew automatically but some don’t. It’s also illegal to own a motorbike (or any vehicle) that is uninsured and not SORN off the road. You need to keep on top of your motorcycle’s paperwork – make sure it’s insured and taxed before you take it out of the garage and back on to the road. And if you’ve had it SORN off the road over winter, you could think about a short term insurance policy if you’re not sure how much you’ll ride throughout the year.